A generation of racial conflict makes it difficult for students from the Lac du Flambeau Band of Lake Superior Chippewa Indians to succeed at the district high school. Since 1998, the Intercultural Leadership Initiative has provided academic and social opportunities, promoted understanding and friendship, and helped youth overcome their prejudices. "Intercultural Leadership Initiative". Honoring Nations: 2008 Honoree. 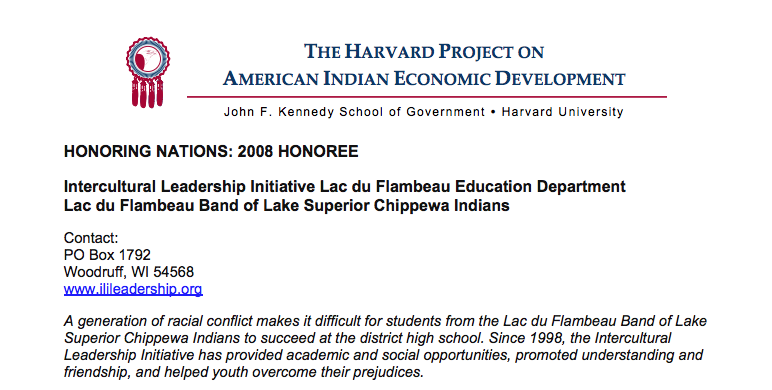 The Harvard Project on American Indian Economic Development, John F. Kennedy School of Government, Harvard University. Cambridge, Massachusetts. 2009. Report.